Krystal Clear™ is a ready-to-use water-based blend of ingredients specially formulated to clean, brighten, and polish glass surfaces without streaking or fogging. 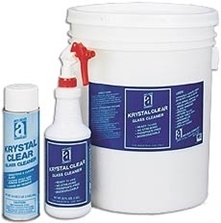 Krystal Clear is a state-of-the-art formula that is simply the very best glass and appliance cleaner. Applications: Windows, mirrors, windshields, TV screens, porcelain, Formica, ceramic tile, vinyl upholstery, stainless steel, and chrome. Will not cloud plexiglass or other plastic materials.